Mustering of the Polish Armed Forces in the Soviet Union (Polskie Siły Zbrojne w ZSSR), known as “Anders’ Army”, began during the latter half of 1941. Until the end of July 1941, the Polish Government-in-Exile in London had not maintained diplomatic relations with the Soviet Union, condemning her as an invader who had conspired with Nazi Germany to seize the eastern portions of Poland during the invasion of 1939. Even the dramatic volte-face in the wake of Hitler’s attack on the Soviet Union on July 22, 1941 did not bring about an immediate thaw in Polish-Soviet relations. The Polish Prime Minister in Exile, Wladyslaw Sikorski, maintained that Poland should seek avenues of consultation with the Soviet Union and that she should join the new alignment of forces arising out of the Soviet Union’s entering the anti-Nazi camp. The Poles did insist however that any agreement with the Soviet Union be conditional upon an unequivocal Soviet commitment that the Polish state to be reconstituted after the war have its former eastern borders reinstated – that is, the Soviet Union was to rescind its annexation of Western Byelorussia, the Western Ukraine and the Vilna district. The Soviets refused to undertake any such commitment while the tense and exhausting deliberations on the issue resulted in a split amongst the Poles. The radical faction among the Polish exiles — the Endeks,* the last of the Sanacja** supporters of Pilsudski and also a minority of the socialists — would not agree to any formulation that did not set out in detail the eastern Polish boundaries. However, a majority in the Polish Government-in-Exile was inclined to accept a compromise formula that deferred drawing the map of the eastern sector to a later date. The official agreement, signed by representatives of Poland and the Soviet Union in London on July 30, 1941 contained a clause stating that "The Government of the Union of Soviet Socialist Republics recognizes that the Soviet-German treaties of 1939 relative to territorial changes in Poland have lost their validity." A prime consideration for Sikorski in seeking an agreement with the Soviet Union was the anticipation of establishing in the Soviet Union a Polish contingent which would be subordinate to the Polish Government-in-Exile in London. The forces that the Poles had managed to muster in the West after the debacle of September 1939, had been almost completely lost in the campaign in France. The Poles attached much importance to a substantial Polish force taking its place alongside the Allied forces in the struggle against Hitler. In the wake of the debacle, masses of Polish citizens had reached the interior of the Soviet Union, some as prisoners-of-war, some as refugees who had fled before the Germans and some as exiles deported by the Soviet authorities; their number is estimated to have reached a million to a million and a half. A large proportion of these, perhaps even the majority, were interned in Soviet prison camps, where they suffered greatly from degradation, intense hardship and harsh weather. The agreement which was signed in July 1941 stated that "The Government of the Union of Soviet Socialist Republics expresses its consent to the formation on the territory of the Union of Soviet Socialist Republics of a Polish Army under a commander appointed by the Government of the Republic of Poland, in agreement with the Government of the Union of Soviet Socialist Republics. The Polish Army on the territory of the Union of Soviet Socialist Republics will be subordinate in operational matters to the Supreme Command of the USSR on which there will be a representative of the Polish Army." In a separate protocol appended to the general agreement, the Soviet Government undertook, immediately upon the reestablishment of diplomatic relations, to "grant amnesty to all Polish citizens who are at present deprived of their freedom on the territory of the USSR either as prisoners-of-war or on other adequate grounds." It is estimated that the number of Jews among the Polish exiles in the Soviet Union reached 400,000 about a third of the total number. Their proportion among the exiles was thus more than triple their proportion among the population of the independent Polish State in the years between the wars. It was only natural that the persecuted Jews should seek refuge in the Soviet State; their numbers would have been even greater had it not been for the obstacles preventing mass evacuation and flight in the first weeks after the outbreak of war between Germany and the Soviet Union. Many of the Jewish exiles were banished and imprisoned under cruel conditions in Soviet prisons and labor camps. Thanks to the accord reached between Poland and the Soviet Union and the subsequent military agreement, masses of tortured, frail and infirm Polish citizens, Jews among them, were released from the prisons and the camps; recruiting of Polish military units and the armed struggle of the Poles became possible. The first Polish units — two divisions plus a support force— were concentrated in army camps/in the Saratov region of the Volga. (Staff headquarters were set up at Buzuluk, over 100 km. from Kuybishev; one division was at Tatishtyevo and the other at Tock.) General Wladyslaw Anders was given command. With the opening of the Polish Embassy in Kuybishev, diplomatic relations between the two countries were normalized. The first Polish Ambassador to the Soviet Union during the war years, Professor Stanislaw Kot, was, until his appointment to this post, a senior minister in the Government-in-Exile, and was regarded as a close friend and confidant of Sikorski's. Kot and his staff showed much initiative and ingenuity in organizing a system of consular offices, locating Polish citizens in the far corners of the Soviet Union and offering speedy assistance to those in need. In the network of “delegations” which spread their protective presence over the exiles in the Districts and Republics throughout the Soviet Union, Jews were also assigned positions, albeit at subordinate levels. Despite numerous inequities it is only fitting to point out that a large number of Jews did benefit from the substantive aid offered by the Polish welfare program, which received assistance in the form of shipments from the free countries. Even in the preliminary organizational stages of the Polish military force, differences arose between the Polish command and the Soviet authorities. The Soviets initially restricted conscription to 30,000 men, while the Poles asked for far more and spoke of an army of 150,000. Thousands of Polish officers among the prisoners-of-war could not be located, while the Poles demanded that they be released to serve as the professional and command cadre essential for the army in formation. There were also differences of opinion as to military and strategic matters: The Soviets sought to accelerate and curtail the training period of the recruits, and to send separate divisions to the front, while the Poles demanded that the recruits be given thorough training and be committed to battle only as a consolidated unit. These differences arising out of deep-seated mutual distrust and variance in goals, marked the beginning of the break which ultimately led to the transferring of the Armed Forces of General Anders outside of the Soviet Union and, after the revelations concerning the Katyn Massacre, to the severing of diplomatic relations and to far-reaching developments affecting the Polish nation and the Polish state. 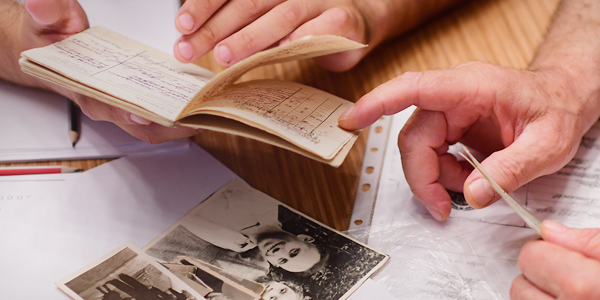 From the very beginning of the recruiting, thousands of released Jewish prisoners and exiles flocked to the collection points, acting either on their own initiative or on the basis of orders. For the majority, mobilization signified a guarantee of day-today existence and a relative sense of permanence, given the war situation. Official directives set out the criteria of preference and eligibility for service in the Polish Armed Forces in the Soviet Union: a) officers and N.C.O. 's formerly on active service; b) enlisted men who had been on active service; c) volunteers who underwent pre-military training and were found eligible by the recruiting committees. The first units set up had a very large number of Jews; according to Anders the Jews at times constituted sixty per cent, and according to Kot, forty per cent. The surge of Jews to the ranks of the Polish Armed Forces aroused suspicion and dismay. In Polish sources one finds complaints to the effect that the Russians intentionally released the Jews from the camps -before all others so as to flood the Polish Armed Forces with the "Jewish element." In a letter to the Polish Foreign Minister in London on November 8, 1941, Kot writes that "the Soviets delayed by various means the release of the Polish element who were in better health and spirits, sending instead the handicapped and the Jews." Another complaint was incessantly voiced by the Poles in the matter of the "national reckoning" which they had with the Jews. Anders himself would begin every meeting with Jewish representatives and delegations, and the orders he issued relating to Jews, with the "reminder" that the Poles bore the Jews a severe grievance for their disloyal behavior during the occupation and internment in the prisons and camps.13 In his book, An Army in Exile, describing the Polish Armed Forces organized in the Soviet Union, Anders begins the chapter on "The Jews in the Armed Forces" with these words: "I was greatly disturbed when, in the beginning, large numbers from among the national minorities, and first and foremost Jews, began streaming to enlist. As I have already mentioned, some of the Jews had warmly welcomed the Soviet armies that invaded Poland in 1939..." In documents that were not intended for publication or for public consumption, General Anders' style is much harsher. Kot, too, writes in his report to the Foreign Minister in London, that "the Poles feel very bitter towards the Jews for their behavior during the Soviet occupation — their enthusiastic welcome of the Red Army, the insults which they directed towards the Polish officers and men who were under Soviet arrest, offering their services to the Soviets, informing on Poles, and other acts of the sort." This one-sided accounting, listing only injuries to Poles and reminding Jews of them — injuries for which the Jews were collectively blamed — and the total disregard for Poland's anti-Semitism and anti-Jewish policy between the wars, in particular the violence and organized persecution of the late thirties was but the first in a whole series of claims invoked to "justify" discrimination against Jews serving in the Polish Armed Forces in the Soviet Union. "The liberation of Polish citizens in accordance with the agreement was greeted by the Jews with great enthusiasm. The decent ones among them rejoiced at Poland's achievement, while the inferior element sought to cover up their past behavior by vociferous identification with Poland. It was from this element that large numbers streamed to enlist in the Armed Forces. Not knowing what to do with themselves, they decided that it was obligatory to join the Armed Forces, and once having joined they almost always became a burden. They were found unfit for military service or they were deferred for a time, and meanwhile they would noisily demand that the relief work be continued." The claim that the Jews were "unfit for military service" undoubtedly had much deeper roots. Amongst the Poles, and in particular amongst the professional soldiers, the opinion was commonly held that the Jews were cowards by nature and were not suited for military service or useful on the battle-field. The testimonies of Jews who served in the Armed Forces of General Anders and of those who tried to enlist are replete with accounts of many who were rejected because of their Jewish ancestry, and tell of crude injustices done to others who were permitted to serve but denied promotion. These very testimonies reveal the existence of two stages in the recruitment process. During the first stage, which extended from the granting of pardons and the beginning of the organization of the Armed Forces until the end of 1941, a large number of Jews were accepted and they constituted a sizable proportion of the units being formed. However, those Jews who were accepted and remained in the ranks throughout the duration of the war, relate that Jews were often transferred to the support units and to the kolkhozes in the wake of deliberate "inspections" and re-examinations, or were simply cashiered from the service. During the second stage, when the recruiting was carried out at several centers in Soviet Central Asia, disqualification of Jews, according to these testimonies, was automatic: Jews would try a second and a third time to enlist, and each tune they would meet with a flat rejection. Their physical fitness had no bearing on the decision; they were disqualified just because they were Jews. These disqualifications, according to the testimonies, were only rarely based on restrictions or prohibitions imposed by the Soviet authorities; the principle of collective disqualification was, however, applied not only to Jews but to Ukrainians and Byelorussians as well. Henryk Dankiewicz, a student of the Warsaw Polytechnic, with an assimilated background, was among the first to present himself for recruiting. He was accepted and sent to officers' training school. In January 1942, the commander of the school singled out "twelve Jews, and one Pole for the sake of appearances" and informed them that they were being expelled from the course since they were not suitable officer material. Some time later, they were transported to a different place and again brought before a recruiting committee. This committee assigned to each of them, without exception, type E classification which meant absolute disqualification. Dankiewicz tried his luck one more time in the city of Tzezar in Uzbekistan, and there too the scene repeated itself: all the Poles, without exception, were accepted and the Jews, Ukrainians and Byelorussians were rejected. Dankiewicz finally enlisted in the army organized by the Polish pro-Communists in the Soviet Union; he was given offi-cer's rank and fought later in the Kosciuszko division. Another Jew, Michael Licht, a gymnastics and sports teacher by profession, who had served as N.C.O. in the battle over Poland at the outset of World War II, also presented himself at the recruiting center together with several other Jews who were, in his words, "strong as oaks;" all of them were disqualified, having been found physically unfit. Licht tried to enlist a second time, and was accepted, making him feel as if he had "finally made it." However, ten days later he was expelled from the service together with all the other Jews. According to his testimony, only Jewish physicians were kept on, or those who paid a hundred-dollar bribe to the Polish officers. He also claims that the taking of bribes by the Polish officers was done quite openly. "The scenes familiar from Poland before the war were here reenacted. The Poles were automatically included among the ranks of the army; the Jews were graded type "D" — unfit for active military service — and even those who had already been accepted were expelled for trivial reasons. Finally, my turn arrived to appear before the committee; appearing together with me was Richterman, a swimming champion. Both of us were graded type "D"..."
"I was accepted into the army without any difficulty. During the first stage of organization many Jews presented themselves for enlistment; in the beginning they were accepted without any difficulties and there was in fact a Jewish majority in the army. This naturally did not please the Poles who sought ways of getting rid of the Jews, or at the very least of limiting the percentage of Jews accepted into the army. The Polish Command thus ordered all soldiers to appear before a medical board. During the examination most of the Jews were marked grade "D" for physical fitness and were released from the service. This occurred at the outset of the winter of 1941-42. Men were freezing from the cold and nevertheless they were released. The Polish Army remained free of Jews — judenrein as the Germans put it. From then on, Jews were not accepted into the Polish Army; only Poles were accepted." "...complaints are again being voiced by Jews that a purge is being carried out in the ranks of the army so as to reduce their numbers, and that those who are healthiest are being released as sick. Is this necessary and does it serve our interests at this time...? " Who then were the Jews who were nevertheless accepted into the army in 1942 or who succeeded in remaining in the army despite the obstacles placed in their way and despite the purges? The impression is that physicians and those trained in the professions in demand were accepted, as well as individuals enjoying the backing of influential Poles. The Jews who remained in the army were those who were protected by their superiors or those who simply could not be expelled because of their excellent service record. "...in the future, when we will be dealing with the eastern borders, this stream of Jewish recruits will be of considerable political weight, particularly when the Ukrainians' systematic hatred of anything Polish is taken into account..."
In that very same letter he notes that "our men in the Armed Forces, particularly those types like Pstrokonski, are already anxious to institute a numerus clausus in the military institutions." "The matter of the recruiting was raised and on this point General Anders made the strange request that members of the minorities, first and foremost the Jews but also the Ukrainians and the Byelorussians, not be taken into the Army. Jewsiegnie-jew pointed out that they were Polish citizens, and the Polish-Soviet Agreement stipulated that all citizens of the Polish Republic be accepted into the Army. General Anders then remarked:'There are so many Jews that they will judaize the Army and their flocking to the Army will radically alter its entire character.' "
"...I am counting on 150,000 people, that is eight divisions together with the army's maintenance forces. Perhaps there are even more of our people, but among them there is also a great number of Jews who do not want to serve in the army. Stalin: Jews are poor warriors. Gen. S.: Many of the Jews who reported are speculators or have been punished for dealing in contraband; they never will make good soldiers. These I don't need in the Polish Army. Gen. A.: Two hundred Jews deserted from Buzu-luk upon hearing the false report on the bombing of Kuybishev More than sixty deserted from the 5th Division a day before the distribution of arms to the soldiers was made public. Stalin: Yes, Jews are bad warriors." It seems that these three persons found a common denominator in their assessment of Jews as soldiers. There is also no doubt that Sikorski and Anders carefully weighed everything they said during the course of their discussion with Stalin and they realized the full significance of their words. The very fact that the Poles were given permission to set up an autonomous army within the Soviet Union conferred preferential status and the power of authority. (For many, the chance to be recruited while in the Soviet Union was virtually their salvation.) The Poles realized immediately that they had been granted a position of power and this recognition enhanced their feeling of security and mastery. They did not at first dare to make full use of their freedom fearing that any step contrary to Soviet law and accepted custom would have repercussions. It may be assumed that this was what prevented them from blocking from the very beginning the stream of Jews who sought to enlist in the Army. In discussions with Soviet officers, and in particular in the discussion with Stalin, the Poles sought to sound out the Soviet reaction to imposing restriction on the recruiting of Jews and other minorities. The Poles knew full well that official discrimination against Jews was not acceptable at that time in the Soviet Union. Many surmised — as did the rightist forces in Europe — that a secret pact existed between the Jews and the government and the men in power in the Soviet Union. Stalin's concurring with Anders' and Si-korski's evaluation of the Jews and their ability as soldiers removed any doubt from the hearts of the Poles. The Soviet leader in his turn also knew how to exploit the Poles' frankness to his own advantage, as we shall later see. Just a short while after the talks with Stalin and after operative consultations at the military level, Soviet liaison officers informed the Polish Armed Forces authorities in late December that recruiting for General Anders' Army would encompass all Polish nationals of Polish descent, with the exception of Jews, Ukrainians and Byelorussians, who on November 29, 1939 were resident in the territories annexed by the Soviet Union and declared Soviet citizens. On December 30, Anders sent a telegram to Kot in Kuybishev reporting that two days earlier he had been told by Colonel Wolkowysky, a senior Soviet liaison officer, that "of all the Polish citizens living in the Western Ukraine and Western Byelorussia, only ethnic Poles may be recruited for our Armed Forces." On February 21, 1942 Anders cabled Sikorski stating that the Soviets authorized recruiting of all Polish citizens; from the territories held by the Soviets in 1939, only ethnic Poles were to be recruited. On February 25 Kot asked Anders to clarify the recruitment rights of non-ethnic Polish citizens — whether it was intended to exclude those who were born in the territory taken over in 1939 or was referring to any individual who was a permanent resident of these territories prior to the outbreak of the war? To this Anders replied: "The Soviet authorities have officially informed me that recruiting encompasses all Polish citizens who until November 29 (1939) were residents of the territories occupied by the Germans [formerly held by the Soviets]." As we have already noted, the heads of the Polish Armed Forces and the central political leadership were both interested in excluding the Jews, or at the very least in limiting as much as possible the number of Jews in their army. The Soviet initiative directed towards preventing the Jewish citizens of Poland from enlisting should have helped the Poles to achieve their goal, for it gave them a ready-made answer for the free world: the discrimination was a result of a Soviet coercion and pressure. However, the matter was not so simple. At first glance it seems that the Soviet restriction applied only to the members of the other ethnic groups resident in the annexed territories on the date that Soviet citizenship was conferred on all the residents of these territories; as for the Poles in the annexed territories, they too had become Soviet citizens but the Soviets claimed that they were showing exceptional lenience and making an extraordinary gesture in allowing them to be recruited for the Polish Armed Forces. Consent to this restriction was tantamount to indirect recognition of the Soviet annexation of Polish territory, and to this the Poles were, of course, vociferously opposed. The Soviet-imposed restriction thus put the Poles in a quandary, and it is against this background that one should view the anxious questioning by the various Polish authorities concerning the precise meaning of the restriction. It was perhaps not by chance that the Soviets chose the matter of the recruiting for the Polish Armed Forces as a means to undermine the jurisdiction of the Poles over certain categories of Polish citizens living in the occupied territories. It is reasonable to assume that the idea of excluding Jews and other minority groups was broached only after Sikorski and Anders had voiced their anti-Jewish comments in the presence of Stalin and after they had revealed their intentions of disqualifying the Jews as being unfit for "our Army." An episode that occurred the day after the conversation with Stalin, at -a- dinner given by Stalin at the Kremlin in honor of Sikorski and his aides, is most revealing. Sikorski again raised the issue of the release of pri-soners-of-war from Soviet "labour divisions" and complained that the process was too slow and not sufficiently comprehensive. Anders then remarked that he had been officially informed that Byelorussians, Ukrainians and Jews would not be released at all. "Were they not Polish citizens?" he asked in anger. "They have never ceased in fact to be Polish citizens, because your agreements with Germany have been annulled." Stalin then replied, all the while ignoring the basic question that Anders had raised: "What do you need Byelorussians, Ukrainians and Jews for? It is Poles you need, they are the best soldiers." There was another fundamental question of great concern which became a subject of dispute between the Soviet and Polish authorities. In the eyes of Soviet law, the residents of the annexed territories were regarded as Soviet citizens, but according to the agreement signed between the Soviets and the Poles these residents were Polish citizens. This ambiguity led of necessity to friction. On November 10, 1941, Kot lodged a complaint with the Soviet Ministry of Foreign Affairs that attempts had been made in Kazakhstan to conscript Ukrainians, Byelorussians and Jews into the Red Army, despite the fact that they were Polish citizens and not subject to conscription; he also complained that Polish citizens who were not ethnic Poles were being prevented from reaching the recruiting centers of the Polish Armed Forces. In the Ministry's response of December 1, the Soviets attempted to present their interpretation of the Soviet-Polish Agreements in a manner which would not seem to run counter to the legislation turning residents of the annexed territories into Soviet citizens. The recognition of the Polish citizenship of ethnic Poles residing in the eastern territories "shows the good will and readiness to compromise of the Soviet Government, but can in no case serve as a basis for the analogous recognition as Polish citizens of persons of other nationalities, in particular, Ukrainian, White Russian and Jewish." The response did not however refer in any way to the right of the ethnic groups in the eastern territories to enlist in the Polish Armed Forces. Naturally, the status assigned to Jewish nationality or religion in this context raises pointed questions concerning the attitudes of the Soviet regime and Communist ideology; however, as in so many other cases, here too pragmatic political interests took precedence over ideological principles. The Polish Embassy rejected both the claim and the interpretation of the agreement as made by the Soviet Foreign Ministry. Kot explained that from the Polish standpoint all citizens, regardless of ethnic origin or race, enjoyed equal rights, and this equality applied both to the amnesty being granted and to the privilege of enlisting in the Polish Armed Forces. Polish law did not discriminate among its citizens, and the military agreement granted every Polish citizen the right to enlist in the Polish Armed Forces. On January 5, 1942, the Soviet Foreign Ministry replied that after studying the arguments put forward by the Polish Embassy with regard to the different categories of citizens, it saw no reason to modify its position. It continued in a lengthy paragraph "explaining" the distinction between "occupation" and the "entry" of Soviet soldiers into the eastern territories of Poland; the gist of the claim was that the annexation of the territories was carried out "as the result of the freely expressed will of the population of those districts." This correspondence between the Soviet Ministry of Foreign Affairs and the Polish Embassy was preceded by an announcement by military circles to the effect that certain categories of citizens were not to be recruited; no protest is known to have been lodged either by military or civilian elements in the Polish camp against the Soviet restrictions imposed in the military sector. Kot empha-zises that in the discussion with Stalin of March 18, 1942, Anders did not even hint at the issue of the restrictions on the recruiting of the national minorities. The documentary evidence and eye-witness accounts indicate that the Soviet authorities did not as a general rule actively interfere in the recruiting process, and they did not enforce rigid adherence to the regulations stipulating rejection of certain of the national minorities. Soviet representatives did sit on the recruiting committees, but only on very rare occasions would they investigate the ethnic background of the potential recruit; for the most part they refrained from taking an active role in the work of the committees. "According to Paragraph 4 of the decision of the Governmental Committee for the Defence of the Soviet Union, of December 22, 1941, citizens of Polish extraction who until 1939 were residents of the Western Ukraine and Western Byelorussia may be recruited for the Polish Armed Forces. Citizens of any other ethnic origin who lived in these territories are not to be recruited." Further on in the letter, General Panfilov claims that the above paragraph of the Soviet decision had been contravened by the recruitment of "escaped Soviet citizens." Following a severely worded protest he then proceeds to list by name ten such "escapees" and demands that they be handed over. Seven of the names are unquestionably Jewish and the three others are Byelorussian or Ukrainian. Panfilov closes with the request that he be informed as soon as possible of the hand-over so that these men may be brought to trial. The letter apparently refers to individuals who had fled from the "work units." Residents of the "western territories" (zapadniki), particularly Ukrainians, were considered to be too unreliable an element to be posted to the front, and they were therefore chanelled to conscripted work units. We indeed know of Jews escaping from these units, which were subject to the harshest of conditions, and fleeing to recruiting centers of the Polish Armed Forces. The individuals in question had had Soviet citizenship imposed on them, but in accordance with the terms of the Polish-Soviet agreement, were still regarded as Polish citizens, and could in theory enlist in General Anders Armed Forces. The Soviets, however, regarded them as deserters from conscripted Soviet units, to be treated as such. However, as already noted, the Soviets did not generally insist that the recruiting for the Polish Armed Forces be strictly in line with their directives. Numerous testimonies from Jewish candidates for enlistment and from individuals who actually served in General Anders' Armed Forces do not intimate that anyone was rejected on the Soviet representative's intervention or because he was a resident of the annexed territories. Moreover, no difference whatsoever can be discerned in the treatment of the "legitimate" recruits from the western provinces as opposed to treatment of those who, according to Soviet directives, should have been rejected. We have in our possession a list of recruits, both Poles and Jews, drawn up by the military some time between 12-20 of August ,1942, that is a short while before the second stage of the evacuation from Russia. This list, unique among the papers found in Anders' files, reveals that of a total of 88 Jews presenting themselves for enlistment, 65 were disqualified and 23 were found fit for service; in contrast, out of a total of 75 Poles, 56 were listed as fit for service. The list also states the grounds for disqualification, but in no case does it note that the Soviet directives were the reason. "The position taken by the Soviet authorities with regard to citizenship has paved the way for discrimination against Jews on the part of Polish antiSemitic elements. This was most blatant in the matter of recruiting for the Polish Armed Forces. The fact is that the position adopted by the Soviet authorities was instrumental in the exclusion of thousands of Jewish youth who were fit to serve, from the ranks of the Armed Forces. However, a large share of the responsibility for this state of affairs devolves upon Polish military elements." "...4. It should be brought to General Anders' attention that the systematic anti-Semitic policy pursued by the General Staff — a policy at which certain officers on the recruiting committees excelled — unwittingly serves the interests of the Soviets, who are seeking to distinguish between Jews and Poles so as to create a precedent which would enable them to take over the territories in the east..."
Here Kot makes no mention of the Soviet prohibition nor does he claim that it is tying the hands of the Poles; quite the contrary — he emphasizes that Polish officers are cooperating with the Soviets and are carrying out their wishes by getting rid of the Jews. It is clear, therefore, that the Soviet directives did not have a decisive influence upon the policies and practices of the Poles with regard to the recruiting. The Soviet directives actually gave the Poles a free hand and served as a ready pretext which was later used to justify to the outside world the low percentage of Jews in the Polish Armed Forces. From a political point of view, the aims of the Poles and the Soviets were diametrically opposed. The Russians sought to emphasize the basic political principle of distinguishing between segments of the popula-tion in the east and the other parts of Poland, thus creating a precedent for the future. Whether the Poles were carrying out the order in practice, and preventing Jews from enlisting did not particularly concern the Soviet authorities, although they did fear the possibility of desertion from conscripted units of their own and escape from camps. The Russians attached no importance to the recruiting of Jews from the eastern provinces — the fact is that at a later stage the Soviet authorities placed no restrictions upon Jews from the various pre-1939 Polish provinces who wished to join the ranks of the Berling Polish Army, which was set up by the Communist-influenced League of Polish Patriots (Związek Patriotów Polskich). The Poles, in contrast, sought to base their relations with the Soviets on mutual agreements; in the recruiting process they abstained from any decision that would be of political significance vis-a-vis the future of teritories. They were however definitely interested in rejecting the majority of the Jews who sought to enlist in their ranks and in reducing the number of Jews already accepted. In this clash between the two approaches and the two sides, the Jews were always the losers. The rights of Polish citizenship were denied to some, as were the possibilities of receiving Polish papers, material aid, exit visas from the Soviet Union and the legitimate right to enlist in the Armed Forces. Although in Polish military circles there was some difference of opinion concerning the political significance of the Soviet directives, they most willingly adopted the selectivity which was their key feature, adding to it their own brand of discrimination and rejection. 3. The "Jewish Legion" and the "Jewish Unit in Koltubanka". For a while the concept of a separate "Jewish Legion" within General Anders' Armed Forces in the Soviet Union drew the consideration and the attention of Polish and Jewish sources alike. The idea was independently raised at one and the same time by two individuals active in the Zionist-Revisionist Movement in Poland between the wars — Mark Kahan, a lawyer, and Miron Sheskin, an engineer. Both had been imprisoned in Soviet camps, had been released following the Polish-Soviet Agreement, and had managed to reach the first recruiting centers of the Polish Armed Forces. Only after they met did they band together to try to put their idea into action. Mark Kahan was sent to the Tock concentration center. He found there that relations between the Poles and the Jews were unstable and at times violent fights would erupt. It was this situation which, he says, brought home the need for separating the Jewish from the Polish soldiers; this in turn led to the idea of establishing a "Jewish Legion" within General Anders' Armed Forces. He brought his proposal before General Michal Tokarzewski-Karasiewicz, the commander of the force in Tock and an acquaintance of his from the pre-war days of independent Poland. According to Kahan, Tokarzewski showed interest in the idea of establishing a Jewish unit and promised to take up the matter with Anders. Kahan was subsequently summoned to army headquarters in Buzuluk, where he met Sheskin who told him of his meeting with Anders that had been arranged on his own initiative to discuss the possibility of setting up a Jewish unit in the Armed Forces now organizing. We do not have material in our possession that could shed light on Shes-kin's motives for making the proposal. After the war, both Kahan and Sheskin claimed that in the forefront of their minds was the potential role that a Jewish military force might play in the envisaged battle for Eretz Israel. Kot notes that the two advocates of the idea regarded the planned unit as a force that would eventually reach the battle theater there. It is indeed quite conceivable that Kahan and Sheskin, both of whom had been active in Zionist-nationalist affairs, did in fact hope that the unit would eventually have a role to play in a Jewish national struggle, even though the immediate stimulus for establishing a Jewish unit arose from the troubled relationships prevailing among the Jews and the Poles within the ranks of the army in formation. We do not have the written material that Kahan and Sheskin presented nor do we know the precise date of their joint initiative. From Kahan's testimony and the comments of Rabbi Rozen-Szczekacz, a chaplain in the Armed Forces of General Anders who was a close friend of both Kahan and Sheskin, one culls the impression that their plan called for concentrating all the Jews already recruited and those seeking to enlist into one separate unit; all the enlisted personnel and officers of the unit would be Jews, while only the senior military and command positions would be manned by Poles. Since the discussions on the establishment of this separate unit took place some time before Sikorski's trip to Moscow, and on the basis of other indications as well, one may assume that the idea was first broached during the months of September-October 1941. After Kahan's arrival in Buzuluk, Anders summoned Sheskin for an additional discussion during which he made it clear that he regarded the "Jewish Legion" plan as essentially political in nature and therefore falling within the purview of Ambassador Kot. Kahan and Sheskin thereupon proceeded to Kuybishev to meet with Kot. The Ambassador put off deciding on the matter pending Sikorski's arrival, apparently because he wished to discuss the matter with him. Some time later Kot returned a categorically negative answer. The Poles utterly rejected the proposal to establish a separate Jewish unit within their Armed Forces in the Soviet Union. Kahan surmises that the matter of the "Legion" was raised during Sikorski's discussions with Stalin, and that it was at this level that it was rejected. He also assumes that the opposition came from Stalin and that Kot did not dare to defend the proposal in the face of Stalin's nyet. However, these assumptions have no basis in actual fact. One can hardly imagine that the Poles attached such importance to the proposal that they saw fit to raise the issue during the summit meeting with Stalin. From the information at hand we can conclude that the Poles were not in the habit of discussing with the Soviets matters relating to the composition and internal structure of their armed forces — this matter was exclusively for Polish determination. The full minutes in our possession of the discussions between the Poles and Stalin and his aides, reveal not a single trace of the proposal to establish a Jewish unit within the Polish Armed Forces. One does find references indicating that certain Poles — among whom were Anders and Kot — took note of the proposal to set up a separate Jewish unit, but nowhere is there any indication that the Soviets had formed an opinion on the matter or that Soviet considerations had any bearing whatsoever upon the decision of the Poles. It is clear, therefore, that the negative decision was taken by the Polish authorities. Kahan claims that some of the senior military staff, including Anders, were in favor of the idea, and that the rejection came from Kot; this version is only partially confirmed. It is apparently true that certain officers in General Anders' Armed Forces did support the idea — for a combination of conflicting reasons. However, Anders and Kot saw eye to eye on the matter, and both were instrumental in its rejection. Kot relates that on October 24, 1941 a discussion was held on the subject at the Embassy in Kuybishev, with the participation of Jewish representatives (of the Bund, undoubtedly including Ludwig Seidman, the Embassy's adviser on Jewish affairs). Anders also took part in this discussion and it was he who blocked the establishment of the separate Jewish unit. On the other hand, Kahan's assertion that there existed a broad front of Jewish opposition to the plan is substantially correct. According to Kahan the Jews of Buzuluk belonged to what had been the affluent class in independent Poland and they feared that the establishment of the "Legion" would endanger their rights to Polish citizenship and perhaps also prevent them from recovering their property after the war. It appears that there was a large proportion of formerly wealthy and assimilated Jews in Buzuluk who for personal reasons were not in favor of the idea of separation. The Bundists, who wielded considerable influence in Embassy circles, adopted a position of emphatic opposition to the plan. On October 16, 1941 one of the senior Bundists who chanced to be in the Soviet Union, Lucjan Blit, sent a memorandum to General Anders "concerning the plan to raise military units manned by Jewish citizens of Poland residing in the Soviet Union. "56 Blit notes that he was informed by the army staff that the number of Jewish recruits was above nine percent, that is, it exceeded the percentage of Jews in the population of pre-war Poland. "This fact, which should have given satisfaction to every true patriot, seems to have led to a number of problems of a psychological nature among the organizers and commanders of the various units of our Armed Forces in the territory of the Soviet Union,"complained Blit. "The cause would seem to be the anti-Semitic feelings which prevail in various degrees among Polish personnel." Blit claimed that staff officers sought to channel overflow Jewish volunteers into the work units or to establish separate Jewish units in an effort to provide a safety valve for these anti-Semitic feelings. He was informed that these tendencies had gained the support of several Jewish communal leaders who belonged to the extreme nationalist faction. Blit, however, claimed that because the Nazi regime which was enslaving Poland was eager to see a division of the population along ethnic and national lines, the establishment of separate Jewish units would necessarily be interpreted as a political and moral victory for Nazism. The Polish command would be undertaking a heavy responsibility for which it would be answerable to the whole world should it decide in favor of such units. The Jewish nationalists sought to create a "Jewish ghetto within the Polish Armed Forces," but to do so would run contrary to the interests of the Polish Government and to the sincere aspirations to live together in harmony "which beat in the hearts of the masses of Jewish workers of Poland." Kot, as was his custom, was here as well guided by diplomatic considerations. He believed that the establishment of a separate unit would serve the Soviet goal of fragmentation and at the same time create an unfavorable stir in the free countries, particularly in the United States. Kot noted that among the initiators and supporters of the idea were "representatives of the RevisionistsJabotinskyites, the lawyer K. from Warsaw and the engineer S. from Vilna and... officers who are known to be anti-Semites are said to be actively supporting the idea of establishing separate Jewish units." According to Rabbi Rozen, three types of supporters of the idea of a "Jewish Legion" can be distinguished within the Armed Forces of General Anders: 1) Real friends, who sought to assist and aid Jewish national aspirations; 2) A group of officers who supported the old regime and resented Sikorski and Anders; they hoped to win the support of Jewish circles abroad by favoring the creation of the "Legion"; 3) Plain anti-Semites who wanted to rid the Armed Forces of Jews through the medium of the "Jewish Legion." "...a series of Jewish communal activists wanted to point up Jewish particularity. The two foremost representatives of Polish Jewry, Alter and Ehrlich, approached me on the matter. After numerous discussions they admitted that their proposal was unrealistic, for it meant that I would also have to set up Ukrainian or Byelorussian units. I took the position that if we were to continue with the forming of the Polish Army, all citizens without religious or ethnic distinctions could be included." Anders goes on to quote at length from a letter he received from Alter and Ehrlich, who were the leaders of the Bund. The letter is dated October 31, 1941, and in it, according to Anders' version, the authors advocate one sole unified military organization in which Jews and Poles alike would be assigned positions on the basis of equal rights. "The primary function of this army must be the waging of the armed struggle on behalf of a free and democratic Poland, the common homeland of all her citizens..." Anders interprets this letter as a retreat from the position the authors had formerly held and an acceptance of his viewpoint. "While we were still in the Soviet Union, several Jewish leaders approached me with the request that separate Jewish units be established. I refused, because in order to be consistent I would have had to establish separate Ukrainian and Byelorussian units too, and this was most undesirable in the Soviet Union. Doing so would have demonstrated the presence of Jews, Ukrainians and Byelorussians in the Polish Armed Forces in the Soviet Union, and the Soviets had tried to prevent that from happening." There is no basis, of course, for Anders' claim that Alter and Ehrlich had originated the idea of separate Jewish units and that under his influence had been induced to abandon the proposal. Kot in his book deliberately points out every false step made by his rival Anders; in this respect he notes that the General's comments on Alter and Ehrlich "do not, of course, conform to the truth." There are however no grounds for assuming that Anders was wilfully misleading; he was probably just mistaken. Totally lacking as he was in understanding of the postures and ideological variations among the main blocs in Jewish public life in Poland, he could easily have attributed to the Bund leaders a stance that was actually quite unthinkable for them. We can however safely assume that Anders' claim that he had contact with Alter and Ehrlich was not pure fabrication. In his book Anders praises the leaders of the Bund as loyal patriots of the Polish homeland, while in a note not meant for publication, he prides himself on having thrown these two leaders out of his office. It seems that Alter and Ehrlich were trying to have tension between the Jews and the Poles in the Armed Forces reduced, and in this connection offered several proposals for Anders' consideration. Anders must have confused this intercession with the proposal to set up a a separate unit, and it was thus that he came to pen the incorrect version of the facts quoted above. At a later stage, Kahan was forced to disavow his own proposal. On March 29, 1942 he sent a note to Anders stating that political developments had made it necessary to revise the proposal with regard to the separate Jewish units submitted by Sheskin and himself. "It is not fitting to give priority to specific Jewish interests" he wrote, "since the policies of the Soviets which seek to deprive the Jews of their Polish citizenship and prevent their enlisting in the Polish Armed Forces, also seek to undermine the territorial integrity of the Polish State; this is a situation which calls for greater, not lesser unity." In concluding his declaration Kahan noted that he had sent a similar letter to Professor Kot in Kuybishev. And in fact, Kot did mention in a cable he sent to the Polish Foreign Office in London on March 25, 1942, that Kahan had informed him in writing that he was revoking his proposal concerning the establishment of separate Jewish units "because the Soviets are now forbidding the Jews to enlist in the Polish Armed Forces and they are likely to take advantage/of the Revisionists' position and use it to buttress their claim.'' In his detailed testimony, Kahan does not mention the letter he sent to Anders and the declaration he transmitted to Kot. On the other hand, in the postcript he wrote for Rabbi Rozen's book, Cry in the Wilderness, which was published in 1966, he stated about the "Jewish Legion": "...would this attempt successfully be accomplished, it would change the whole of Jewish history." This statement is a gross exaggeration which bears no resemblance to a realistic evaluation. Kot, on the other hand, in a letter he sent to Rabbi Rozen in 1951, claimed: "The problem of the unrealized Jewish Legion I knew closer, and today I am of the opinion, that it would have been completely drowned in the Soviet camps and that none of it would have reached Poland or Palestine." Apart from the attempt to create a general "Jewish Legion," there were several local, temporary arrangements in existence whereby Jews were concentrated in special units. D. Katz, a highly experienced electrical technician, relates in his testimony that he chanced upon a reserve unit of this sort which was made up of members of liberal professions (doctors, engineers, lawyers, etc.). He volunteered for enlistment in Yangi-Yul, and in May 1942 he appeared before a medical committee; he was disqualified because he was a Jew, while "maimed, crooked, hunchbacked and one-eyed Poles" were assigned fitness grades that qualified them for military service. However, since he was a qualified engineer he was not rejected outright, and was assigned to a company of civilian experts which operated under military cover. Katz's description of the conditions prevailing in the unit is exceedingly bleak. The unit numbered some sixty men, "all of whom were top-notch and dependable both as to age and profession" while most of the officers were coarse Poles who unceasingly demonstrated their deliberate and insulting anti-Semitism. The unit was not issued an adequate supply of food and the men suffered constantly from hunger pangs. They received no blankets, clothing or serviceable tents, and they literally had to sleep on the ground. No one was at all concerned that they be equipped at least to the extent that regular soldiers were. And no one knew what was planned for the unit: when one of the men asked a senior officer of the division, he was told, according to Katz, that "tests will have to be run, the diplomas checked out, some will be released, and for the rest we'll put up two tents and let them slowly waste away from hunger." Katz noted, with bitterness, that the unit was set up on the assumption that the "army must protect the intelligentsia" particularly in light of the fact that the Nazis were systematically liquidating the intelligentsia of the occupied territory; this "protection," however, was tantamount to torture. At the end of June 1942 the unit was disbanded. Ten or twelve were accepted into the ranks of the army and the rest — "indigent, exhausted men who had been imprisoned in camps and jails on account of their loyalty to Poland and who caught at the army as drowning men at a straw, were scattered to the wind." The Jewish unit which did achieve a certain renown was the Jewish battalion stationed at Koltubanka (a village located not far from Tock, which was the recruiting centre for professional units, such as the men of the armored corps). Kahan claims that the Koltubanka unit was established to serve as a model — or as a small-scale local precursor — for the broader plan for a "Jewish Legion." Kahan says that he was approached by Colonel Leopold Okulicki with the suggestion that a battalion composed of Jewish soldiers already inducted into the army be set up; he was told that if this experiment proved successful it would be possible to set up additional units. A special meeting was held to explain the reason for creation of the unit, and Colonel Jan Galadyk, a Polish officer and devoted friend of the Jews, volunteered to assume command of the Jewish unit. Kahan adds that this offer constituted an unusual gesture on Galadyk's part, since the command of a battalion was generally given to an officer with the lower rank of major. Kahan also claims that relations between the Jews and the Poles within the unit were proper. However, even according to him this idyllic picture was muddied somewhat by the fact that prior to the transfer from Tock to Koltubanka, the Jewish soldiers were stripped of their uniforms and were sent to Koltubanka in rags and without equipment. Kahan tends to view this as an isolated episode, the result of ill-will on the part of one particular Polish officer, an apostate Jew who sought in this fashion to demonstrate his antagonism towards Jews; he does not view this as proof of the existence of a definite policy set up by the Polish military command. Kahan argues that the opposite was true, that the Koltubanka experiment was successful and that Kot bore responsibility for the fact that there was no follow-up to Koltubanka as had been planned. Kahan's description is, however, contradicted on all scores by Rabbi Rozen's description of the general circumstances surrounding the establishment of the Battalion and the conditions in Koltubanka. It will be recalled that Rabbi Rozen had close ties with the original advocates of the "Legion" proposal and he had given his blessing and support to the plan. It also should be noted that Dr. Kahan publicly expressed his agreement with Rabbi Rozen in the postcript he wrote for his book. And yet, according to Rabbi Rozen, the Jewish Battalion was established and sent to Koltubanka at the end of October 1941, i.e. considerably prior to the date when it was decided not to adopt the proposal of establishing a Jewish Legion. According to Rabbi Rozen, before the Battalion was set up the Jewish soldiers in Tock were summarily dismissed from the army in a manner that clearly demonstrated the anti-Semitism of the Poles. All the soldiers were assembled and then officers who in the author's words had themselves just been released from Soviet camps, gave orders to "all those of the Mosaic faith" to step forward. This method of expelling the Jews from Tock came to Kot's attention and he complains about it in one of his reports. According to Rabbi Rozen, the way in which the Battalion was set up resembled nothing more than ghettoization. When Rabbi Rozen protested to Colonel Galadyk of this degrading attitude — an act which placed the Rabbi in personal danger — Galadyk justified the actions by claiming that the Jews "might live happier in ghetto barracks rather than dwell together with antiSemites and Hitlerites." In the wake of the protest the officers attempted to justify the system. According to Rabbi Rozen the Jewish soldiers were made miserable preceding the transfer to Koltubanka. They were, for example, issued with boots that were too small and many of the soldiers had to go barefoot as a result. And Koltubanka itself, after Tock, in Rabbi Rozen's words, was merely the exchange of a small ghetto (Tock) for a "larger ghetto" numbering some 1,000 men. In the light of the alarming news from Koltubanka, Okulicki sent Rabbi Rozen "to straighten out matters...there." According to Rabbi Rozen, Okulicki regarded whatever was happening there as matters among the Jews, and not as a matter of anti-Semitism in the army.75 Rabbi Rozen found the Jewish unit in a very low state of morale and fitness. The Jewish soldiers had been forced to dig their own underground dugouts in the rockhard earth, with the temperature at 40 degrees C. below zero. His first task was to bury the large number of Jewish personnel who had died there. The military kitchen, which was supervised by Poles, often "forgot" or simply refused to issue regular rations to the Jewish soldiers. The officers in the unit were all Jews, but an anti-Semitic Polish captain had command of the Battalion. Colonel Galadyk was in fact stationed at Koltubanka, but as overall commander of the military base and not of the Jewish unit. Rabbi Rozen confirms the fact that Galadyk evinced good will towards the Jews. He had however not come to Koltubanka of his own free will; as a follower of Pilsudski he had been "exiled" to Koltubanka by Sikorski's men. The Jews suffered constantly at the hands of their Polish "comrades-in-arms": "Jewish soldiers were prohibited from passing through the streets where the Polish soldiers camped... If a Jewish soldier from Koltubanka did appear there... he met with both physical and moral degradation in the worst anti-Semitic manner possible." According to Rabbi Rozen, the name "Koltubanka" became synonymous with a "Jewish ghetto" — at army headquarters the mere mention of Koltubanka would elicit cynical smiles, while among Jews it was viewed as a confirmation of their abasement. News about Koltubanka did reach foreign countries. Rabbi Rozen states that the information was published in the free countries, but he does not indicate how the news was transmitted or when it appeared. But we do know of repercussionsarising from the publication of information on Koltubanka, from a cable sent from London by Sikorski to the staff headquarters of the Polish Armed Forces in the Soviet Union, on March 19, 1942. General Anders was asked if a "Jewish Legion had ever been established or was in existence at that time" within the Polish Armed Forces in the Soviet Union; reply was requested by return cable. The answer, sent on March 22 under the signature of General Bohusz-Szyszko, read: "Report that in the Polish Armed Forces in the Soviet Union there never was nor is there now a Jewish Legion." "In exceedingly severe fashion, the politics of anti-Semitism [has been adopted] and applied first and foremost in Tock, the home base of the Sixth Division and the center of reserves. After discussions with several Revisionists who had dreamed of a Jewish Legion and who were popular and influential in army circles back in the homeland, it was decided to separate the Jews and group them in special units. This was carried out arbitrarily on October 7 — upon the order given by a young officer: 'Jews, step out of line." Jewish personnel were then sent to Koltubanka and put under the command of an officer who was known to be an anti-Semite. Jews were subsequently removed from other formations as well, segregated, or discharged en masse, no distinction being made between unreliable elements and those whose discharge would provoke a storm of protest that could only be harmful to Polish diplomacy. One of the senior officers at general headquarters vigorously advocated this system which merged the interests of the anti-Semites with the ambitions of the Revisionists." There is no doubt that Kot's underscoring the collaboration of the Revisionists with the anti-Semites was not just fortuitous. Kot believed that the Revisionists had won the support and the assistance of the Sanacja regime and this regime indeed was anathema to him. As a result, he exploited every opportunity to connect the Revisionists with the anti-Semites who were to be found, in his opinion, largely among the supporters of the Sanacja. However even if we choose to ignore Kot's tendencious commentary we must still reject Kahan's apologetic claims. The description of Koltubanka as a partial, or firststage, realization of the larger plan for a Jewish Legion is not valid; it bears no resemblance whatsoever to the true picture of the harsh reality as revealed in Rabbi Rozen's book and in the testimonies of others. One question remains to be answered: what eventually happened to the Jewish Battalion in Koltubanka? Rabbi Rozen claims that when the Polish Armed Forces in the Soviet Union were transferred to Central Asia, in May and June 1942, "the Koltubanka Ghetto was automatically liquidated" and the majority of the Jews as well as Jewish personnel in other units, were discharged from the Army. However, a small number did manage to remain with the Force in Soviet Asia until August 1942 when they were evacuated with the rest of the Army [to Iran]. Rabbi Rozen does not mention how many of the Jews from Koltubanka managed to remain with the Army nor does he indicate with what unit they served in Central Asia. "Towards the end of the winter of 1942, we all left the camp and were transferred by train to the city of Gusar on the Afghanistan border of Uzbekistan. Several weeks after our arrival, the battalion of Jewish soldiers from the village of Koltubanka also arrived. When the Jewish soldiers were removed from the ranks of the Polish Army in Tock, the Polish commanders thought that they had rid the army of Jews, that they would disappear. They could not possibly have expected that these wretched Jews, who had been expelled from the army, would attain a level higher than that of the Poles in the service. The Poles were astounded on seeing Jews in the uniform of the Polish Armed Forces parading smartly and in unison, all looking fit and well dressed and marching to the songs on their lips." It seems that the situation of the Jewish Battalion in Koltubanka improved considerably with the passing of the time. The change for the better probably came about together with a general improvement in the state of the Polish Armed Forces in 1942; it also resulted from the dismissal of its anti-Semitic commander and the intervention of civilian factors. With the improvement in material conditions, the desire of the Jewish soldiers to demonstrate their ability also grew, and a sort of "Jewish unit patriotism" came into being. (It is here that the positive potential of Jewish units with the capacity for independent development within the Polish Armed Forces, came to the fore.) Lustgarten's testimony shows that Rabbi Rozen's contention that the Battalion was liquidated prior to the evacuation to Central Asia has no basis in fact. One cannot however de-termine from Lustgarten's testimony whether or not a purge of the Battalion was carried out in Koltubanka, as was the case in other units of the Polish Armed Forces. "Shortly after the Jewish Battalion arrived in Gusar, I was also sent there as an instructor — and I felt strange. Around me I saw long-nosed faces, Semitic types; the soldiers openly conversed in Yiddish and in the evenings they gathered together and sang Yiddish folk songs — and all this in the context of a Polish Army. These were not the Jews I had known from the Jewish streets of the Diaspora countries. When I inspected them closely I understood that the Jewish Diaspora characteristics of fear and apprehension were not necessarily characteristic of Jews in general. It was then that I began to believe that Jews would be good soldiers when they felt themselves to be a free nation." According to Lustgarten, the Jewish Battalion was evacuated by train to Krasnovodsk on the Caspian Sea. From there the soldiers sailed to the port of Pahlevi, Persia, arriving a short time before Passover of 1942. In Iran, the Jewish Battalion was disbanded, for the British refused to transfer a separate Jewish unit to Eretz Israel. Kot for his part relates that he does not know the ultimate fate of the Jewish Battalion in Koltubanka. "General Anders put a stop to this harmful trend after the discussion at the Embassy on October 24 (1941) with the participation of representatives of various blocs in the Jewish community. On November 14 he issued a very astute order on the treatment of Jews in the Armed Forces. However, in Tock he met with very strong opposition; he then issued a follow-up order which contained several paragraphs that are politically touchy. His declaration about 'reckoning' with the Jews in the homeland immediately became widely known in the free countries and the commander of the Polish Armed Forces came to be regarded as an enemy of the Jews." The two orders of the day to which Kot refers are in our archives. The first was issued in Buzuluk on November 14 and the second, also from Buzuluk, dates from November 30, 1941. Anders' first order gave a decisive definition of the position of the Jews in the Armed Forces and how they were to be treated. The general directives contained in the order were to be obeyed and followed strictly; a "clear, consistent, unambiguous line" was to be pursued in dealing with Jews, on the part of both commanding officers and soldiers in the ranks. He similarly asked that there be an "end to the rumors and the false charges that spring up behind our backs concerning alleged anti-Semitism in the army," rumors that, Anders claimed, originated from foreign sources. In the body of the order, Anders explicitly stated that Jews had the same rights and obligations vis-a-vis military service as all other Polish citizens. Within the Armed Forces, they were to be dealt with "as sincerely and with the same degree of warmth" as all other soldiers and they were to be granted "the same measure of confidence" as everyone else. In order to prevent any misunderstanding, he spelled out the principal directives governing recruitment of soldiers for active service in the Armed Forces. According to these directives, the following were to be recruited forthwith: officers, subofficers with professional skills, men in the ranks who had seen active service and volunteers who underwent pre-military training and were found fit by the recruiting committee. All others were to be sent to the southern republics of the Soviet Union where the registration of reserve forces would take place. He spelled all this out in refutation of the libel that Jews were encountering difficulty in being accepted into the army. "I order all my subordinate commanding officers to fight relentlessly against any manifestation of racial anti-Semitism." It must also be explained to the soldiers that Poland has always adhered to the principles of democracy and tolerance and any divergence from these principles cannot be countenanced. The Jew will benefit from the same laws that apply to all Poles; drastic action is to be taken against him only "when he does not know how to wear with pride the uniform of a soldier of the Polish Republic and he forgets that he is a Polish citizen." This order, embodying as it did a clear and forceful enunciation of Anders' position on a whole series of key questions, would undoubtedly have had a decisive impact on recruiting procedure and on relationships within the Armed Forces. It is clear, from Kot's comments on the subject and from the wording of the original order, that it was Anders who issued the order and not Sikorski, as has been claimed by the Palestine Haganah Weekly that published Anders' second order. Unfortunately, this authoritative and clear-cut order did not long remain the sole pronouncement that the Commanding Officer of the Polish Armed Forces in the Soviet Union would make on the matter. Some two weeks later, a second order was issued; the wording of this order and its general tenor virtually cancelled out all that was positive in the first order of the day. The second order of the day opens with a reference to the previous order. The first had officially presented the supreme commander's political credo on the Jewish question, which he did not care to have misinterpreted by his subordinates. "I well understand the reasons underlying anti-Semitic manifestations in the ranks of the Armed Forces;" these were reactions to the disloyal, and at times hostile, behavior of Polish Jews between 1939-1940. "I am consequently not surprised that our soldiers, those ardent patriots, regard the matter so seriously, particularly since they suspect that our Government and Armed Forces intend to overlook the experiences of the past. When viewed from this vantage point, our defence of the Jews might seem incomprehensible or historically unjustified and even anomalous." However, explained Anders, the current policy of the Polish Government, tied as it was to the policy of Great Britain, made it imperative to treat the Jews favorably, since the Jews wielded considerable influence in the Anglo-Saxon world. The soldiers must understand that in the interests of the Polish Government, the Jews must not be provoked, for any anti-Semitism was likely to bring about harsh repercussions. "I therefore recommend that our position be explained to the units in a suitably discreet manner and that the hot-heads and the quick-tempered should be particularly warned" that from then on any expression of the struggle against the Jews was totally forbidden and whoever was found guilty of such would be severely punished. "However, after the battle is over and we are again our own masters, we will settle the Jewish matter in a fashion that the exalted status and sovereignty of the homeland and simple human justice require." The differences, indeed the polar distinctions, between the two orders are so pronounced that it is extremely difficult to understand how one man was capable of issuing both documents within the short space of two weeks. The contradictions and vacillations in Anders' orders do however become more comprehensible on comparing Anders' public statements with those he made in closed sessions with Stalin or wrote for inclusion in his own personal files. Kot claimed, as we have already noted, that Anders' retrenchment from the first order and its general orientation was due to pressure applied by the command staff of the Sixth Division located in Tock. We cannot be certain of the validity of this version, for we know that Kot tended to be suspicious of the Tock command which he regarded as a collection of political rivals composed of Pilsudski-ites. There can however be no doubt that the sharp about-face in the wording and content of Anders' orders was prompted by the criticisms voiced by friends and subordinates in his army. There is also no doubt as to which version reveals Anders' real feelings and opinions. In the first order Anders claimed that anti-Semitism was nonexistent in the Armed Forces and that hostile forces had maliciously charged the Poles with hatred of the Jews; for this reason the Poles should be wary and be responsible in their behavior. From the second order, it evolves that there actually was anti-Semitism and the Supreme Commander understood its causes. He did not demand this time that every manifestation of anti-Semitism be unequivocally opposed, but only asked that the hot-heads be held in check and prevented from doing acts of violence. In the first order, the rejection of anti-Semitism was a function of a basic attitude stemming from the constitutional and ideological foundations of the Polish State, while in the second, opposition to anti-Semitism was but a political strategem necessitated by momentary circumstances and the true reckoning by the Poles would have its day when they would be free to act as they pleased in their liberated homeland. Kot noted that Anders' second order found its way abroad and gave the Supreme Commander a bad name. However, the fact that Anders' first order was so radically altered under the influence of friends and military subordinates indicates that hostility towards Jews was not the exclusive attribute of the Supreme Commander. The opposite is true: many military personnel would not have taken a position in defence of the Jews even for reasons of expediency. The truth of the matter is that anti-Semitism was general and widespread throughout the Armed Forces and all the Jewish witnesses, no matter what their outlook, education or position testify to the fact; that proves that even the hypocritical approach of the second order remained a dead letter and was not adopted by the Armed Forces. Thus, some of the testimonies tell of attempts to check anti-Semitism "from above," but these attempts were futile. M. Kahan notes in his testimony that the antiSemitic manifestations increased as the self-confidence and the sense of mastery of the Poles grew, with the consolidation of forces, the acquisition of equipment and the improvement in conditions. This means that not only did anti-Semitism in the Armed Forces not decrease, but it actually became progressively worse. One of the witnesses, a doctor, states that "antiSemitism was expressed in acts of degradation and physical injury." Another witness states that the anti-Semitic treatment of Jews took the form, among other ways, "of frequent and unjustified demands to do physical labor, of insults, and of the fact that Jewish complaints were not investigated and rectified and no steps were initiated against the parties." However, it is only just to note that there were commanders and officers in various units who did try to protect the Jews under their command, and who, despite the difficulties involved, did adopt an attitude of decency and comradeship towards Jews. The Haganah Weekly Eshnab, edited in Palestine by Lieben-stein, (Eliezer Livne), published Anders' second order of the day in its issue of June 28, 1943.At that time, elements of General Anders' Armed Forces were stationed in Eretz Israel, and the publication of the order provoked a sharp response from the Jewish community. The "Representation of Polish Jewry" (Reprezentacja żydostwa polskiego), with its office in Palestine, was composed of representatives of all the Zionist parties (excluding the Revisionists) and of Agudat Israel. They regarded Anders' order of the day as a declaration that "would necessarily give rise to an intensification of antiSemitic trends and not to their weakening" and approached the Prime Minister and Minister of National Defense, Sikorski, on the matter. The "Representation" pointed out that the order stood in direct contradiction to formal and binding declarations made by the Polish Government in London and asked whether the Government intended taking any steps and what conclusions it proposed to draw in the face of the order. The letter to Sikorski was sent on July 5, 1943, the very day on which Sikorski was killed in a plane crash near Gibraltar. "Anders' motives in issuing the order were possibly not as bad as they appear. Given the prevailing mood, he sought to explain a position that had encountered opposition. He did it in an unsatisfactory manner. Anders is merely a soldier, not a politician. A politician would have done it differently and better. There is no cause to turn this into an international issue. I know that when this will become known abroad there will be an outcry about antiSemitism in the Polish Armed Forces, and this in turn might bring about an even more severe reaction on the part of the Poles..."
Later on, in response to a question, Stanczyk said: "I do not want to deny, and I admit, that an anti-Semitic mood prevails among the population that returned from Russia and in the Armed Forces. I note this in pain, but the fact cannot be changed by decree..."
On July 12, 1943, that is less than two weeks after the meeting between Stanczyk and the delegation from the "Representation," the "Representation" received a letter from the Polish Consulate in Tel Aviv. The letter stated that in the course of a conversation between Minister Stanczyk and General Anders, the General had denied outright the existence of any such order and "claimed that the text was forged." Stanczyk added for his own part: "I am convinced that this is a product of hostile propaganda which aims at disrupting relations between Poles and Jews." Among the documents Kot included in his book published in London in 1955, was, as we have seen, Anders' second order. Although it is true that Kot was at that time waging a battle against the General, it is inconceivable that he would have included a spurious document in his book. It is worth pointing out that Anders, in his book, chose to make no mention of the order, although in meetings with Jews he continued to claim that it was a forgery. A meeting was held on September 19, 1943 between Anders and a delegation from the "Representation" at the home of the Polish Consul General in Tel Aviv, Dr. H. Rozmaryn. During the discussion, the engineer Anschel Reiss hinted that "the Armed Forces had been warned not to engage in anti-Semitic tricks, while it had been emphasized that the accounting with the Jews would take place after returning to the homeland." Anders interrupted him at this point and said: "I know that some sort of rag published an order, allegedly coming from me, expressing what you just said. I do not even want to discuss the matter. It is a forgery, no order of this sort ever existed." Polish sources continued to be concerned over the criticism stirred up by the publication of the order. The Polish Consul General in a report dispatched to the Foreign Minister in London (no date indicated) noted that owing to the commotion that the publication in Eshnab had provoked, he had seen fit to arrange a meeting between his deputy, Weber, and Yitzhak Grun-baum. At the meeting Weber reiterated the claim that the order had never been issued and Grunbaum was asked to help quiet the excitement. After consulting with the other officials of the Jewish Agency, Grunbaum agreed to take steps in keeping with the Consul General's request. At the same time, he asked Dr. Rosmaryn to write him a letter confirming that "the document which was published by Eshnab and about which he (Grun-baum) had heard a half-year earlier, was never issued." "Yes, I know. However, there are witnesses, among them ministers, who fought against the order when it was issued. We know that one of the cables referred to the order as a forgery. I have no objection against making such a claim for external consumption, but on the inside, no one should expect me to believe that it was a forgery." The Prime Minister remained silent and after a while said: "I will deal with this matter also." It is clear that anti-Semitism was a general feature of the Polish Armed Forces; it had its roots in traditions of the past and in the ideology and political conceptions of Poland in the period between the wars. The various strata in Polish society were not sufficiently perspicacious to study their own history with a critical eye, nor were they able to perceive just how destructive a role anti-Semitism played in the internal life of the Polish republic and how it had served as a vehicle for the penetration of destructive Nazi influences under the guise of anti-Semitism. In the Soviet Union during the Second World War, Jews and Poles came into contact to a much greater extent than in Poland proper where the Jews had been separated from the local population by the walls of the ghetto; in the immigration centers such as London, there was only a handful of Jews and relations there were generally based upon formal attempts at communication, lacking in the elements of spontaneity and frankness. The political leadership, however, was sensitive to the harmful ramifications of anti-Semitism and it did show an understandable degree of awareness to the negative reactions to the Polish hatred of Jews, by public opinion in the free countries and by influential Jewish circles in the West. However, since their attitude to the issue was ambivalent and was dictated by a whole array of tactical considerations, it is not surprising that periodic "cracks" in their behavior and pronouncements showed up their true feelings. It should also not .be forgotten that the Endeks, who enjoyed a position of respect within the broad-based coalition in London, held Jew-hatred as one of the fundamental elements in their ideological and political outlook. And as we have also seen, anti-Semitism was particularly rampant among the officers of the Armed Forces, and this attitude undoubtedly had its reverberations within the ranks as well. The total evacuation of General Anders' Armed Forces from the Soviet Union was the outcome of the tensions and suspicions that accompanied all dealings between the Poles and the Soviet authorities. The evacuation was also in no small part a product of the differences of opinion and the rivalries that existed among the Poles themselves. According to the operative agreement signed by both the Polish and the Soviet generals, the Poles were to train the recruits in stages, send them into action in units no smaller than a division, and be subordinate to the Supreme Soviet Command. The Polish generals were possibly not fully aware of the significance of the commitments inherent in the agreement. At any rate, the various political and military echelons of the Polish leadership sought to raise a large army to be sent into battle as one cohesive unit in a state of full battle preparedness for they believed that the decision to commit their forces should be made only after all factors had been weighed from the point of view of Polish political interests. Towards the end of 1941, the Soviets demanded that part of the Polish force be sent to the front. The Poles countered with the claim that they had not yet completed battle training. As was their wont, the Soviets then applied a very material form of pressure: they issued orders limiting the rations and equipment to be supplied to General Anders' Armed Forces, and they also made it abundantly clear to the Poles that they would not tolerate for any length of time the continued existence on Soviet territory of a non-combatant army. An untenable situation was thus created, and both sides were constrained to find a solution. Within the Armed Forces the exiles and those who had been released from the camps did, in fact, require a certain period of time to recuperate and undergo military training before going on active service. During the initial stages, the soldiers suffered much from the harsh climatic conditions in the temporary camps in the Volga region. During Sikorski's visit to Moscow the Poles asked Stalin for permission to transfer the troops to a more temperate area. Uzbekistan was then chosen as the major new location. However, the sudden change-over to a warm climate and to an area ridden with disease touched off massive epidemics among the recruits. Uzbekistan was also far removed from general headquarters and from the centers of political decisionmaking. The suggestion to evacuate part of the Force from the Soviet Union was first raised by Sikorski during his discussion with Stalin. Stalin's reaction was most severe, but ultimately he gave his assent for the evacuation of 25,000 men as reinforcements for the Polish troops in the West. Nevertheless, Sikorski opposed evacuating all the troops from the Soviet Union; his basic conception was that Polish soldiers should take part in the battle for the liberation of Poland on all fronts and from all directions. He considered the Soviet front to be of prime importance particularly since the fact that Poles had fought alongside the Soviets would be a trump card in the inevitable bargaining over the eastern borders. The British, for their part, pressed for a full-scale evacuation so that the Polish Armed Forces could reinforce their own points of weakness. There is no doubt that the Soviets were not unaware of these considerations; with deliberate cunning they bypassed the Polish political levels and established direct contact with Anders and his officers, exploiting thereby the commander's extreme ambitiousness. In the course of time, Anders achieved a position of independence in both his military and political activity. Anders flaunted this independence before Kot in Russia; he also apparently had the support of the Polish opposition in London, who saw him as a potential rival of Sikorski's. The Soviets finally decided to rid themselves of the Polish Armed Forces which they now regarded as a political nuisance. They planned to establish another Polish army in its place, this time under the auspices of the Polish Communists in the U.S.S.R.; this army would become a firm support for the Soviets not only in solving the problems of the borders but also in assuring the form of rule for Poland in the future. It is not entirely clear which side actually raised the idea of a total evacuation, Anders or the Soviets. At any rate, Anders accepted the proposal without waiting for government confirmation from London. Anders had his own reasons. One may assume that he feared for the physical existence of his army in the conditions under which they were operating in the Soviet Union and he viewed evacuation as a means of salvation and as an opportunity to obtain an extensive military installation. It may also be assumed that he did not want to see the force broken up into small units for a large and unified force served as a guarantee of his own personal standing. A far from negligible factor in his considerations apparently was his mistaken estimation that the Soviet Union would not be able to repulse the might of the Nazis, and removing his men from the Soviet Union meant taking them out of an area that he believed was destined to be overrun. Attempts were made to procure Soviet permission for continued recruiting even after the evacuation on the basis of signed agreements with the Polish Government in London, but the Soviets flatly refused. The evacuation allowed the Soviets to shut down the welfare activities that had been carried on by the Embassy, and to proceed to build up a Polish political and military force on Soviet soil based upon a handful of Polish Communists and their sympathizers. The Poles in London and Anders' men apparently believed that the Soviets would never succeed in attracting Poles to their cause, and that a Polish force that served the interests of the Soviets could not be created, just as no quisling or traitor had raised his head in Poland under the German conquest. In time it became clear that they had erred badly and their error had fateful consequences for the future of Poland. During the two stages of the evacuation, some 114,000 Poles, soldiers and civilians, left the Soviet Union; the Soviet authorities agreed to allow the families of the soldiers and certain groups among the civilian population, such as children, to be evacuated together with the soldiers. In the first transfer, in March-April 1942, some 44,000 (31,500 soldiers and 12,500 civilians) were evacuated; in the second stage of the evacuation, during the months of August-September 1942, more than 70,000 military personnel and civilians left the Soviet Union (close to 45,000 military personnel and over 25,000 civilians). As has already been noted, the transports made their way by train to the port of Krasnovodsk on the Caspian Sea, and from there they sailed to Pahlevi, Iran. Thus there came to an end the Polish Armed Forces in the Soviet Union which had been established by and under orders from the Polish Government-in-Exile in London. The Polish Armed Forces in the Soviet Union never reached the dimensions envisaged by the Poles. Hindering growth were obstacles placed in the way by the Soviets, such as reduction in equipment and supplies, and adverse climatic and sanitary conditions. Evidently the Poles themselves prevented members of ethnic minorities from joining the army. The force which numbered 34,000 men in December 1941, grew to 66,000 men in March 1942. During the very last stages, just prior to the evacuation, there was an additional, hasty recruitment. In sum total, 72,000 men of General Anders' Armed Forces were evacuated from the Soviet Union. The amnesty and the conscription enabled many to rise from the status of prisoners to free soldiers, from conditions of neglect and extreme hardship to a framework which provided their basic necessities; the evacuation meant a chance for salvation and escape to the free world. When it became known that civilians and relatives of army personnel would be permitted to join the evacuation, a great stream of people moved from the farthest corners of the Soviet Union to the exit points in the south. We will now review the numbers of Jews among the evacuees and the attitude of the Poles and their treatment of Jews during the various stages of the evacuation. According to Jewish sources, some 6,000 Jews were among them, one source giving some 3,500 soldiers and 2,500 civilians. Close to a thousand Jewish children known as Yaldei Teheran (Children of Teheran) were transferred together with a large camp of evacuated children. In total Jews accounted for about five per cent of the soldiers evacuated (five per cent of the enlisted men and one per cent of the officers) and about seven per cent of the civilians. "...2/ on the way, if my memory serves me right, it was March 25, 1942, we discovered that the Soviet authorities had added to our transport five cars of civilians, almost all Jews. According to my lists, there were 330 people, including several children. We were not informed about the coupling on of these wagons. What happened was that at one of the stations we realized that the cars had been attached and that they were travelling with us..."
"Before the first units of the Polish Army left Russia, that is on the 22nd of March 1942, 300 Jews of A classification who had been examined by a Russian health board since the Polish committee was no longer functioning, were sent by the voyen-komat [the Soviet War Office] to the place where the division was stationed. However, [the Poles] ordered them to return to their points of departure. Some of the Jews requested N.K.V.D. intervention and this in turn asked the Polish authorities why these men were not being issued with uniforms and why they were being sent back. The Polish authorities replied that they did not have enough railroad cars to transport them. The N.K.V.D. immediately supplied cars, and faced with this fact [the Poles] took them to Persia but did not provide them with uniforms. At the port of Pahlevi, all the Jews not in uniform were told that they were free to go. Several Jews then approached the British authorities and asked them to intervene, and it was only by command of the British authorities that they all were issued uniforms and inducted into the army." Anders himself and General Bohusz-Szyszko, his deputy, took an interest in the evacuation of the Jews. On July 31, Anders and Bohusz-Szyszko and a Soviet representative, General Zhukov, signed a protocol setting forth which Jews were eligible for inclusion among the evacuees. Paragraph 1 of that document states that relatives of soldiers who were residents of the Ukraine and Byelorussia holding other than Polish citizenship would be allowed to leave only if they could prove a close family relationship with soldiers in the Polish Armed Forces in the Soviet Union. Paragraph 2 stated that separate lists had to be submitted of family members who were residents of the Ukraine and Byelorussia and who were not Poles, and a certification of the authenticity of the lists had to be supplied by the military command. Paragraph 3 spoke of the prohibition against evacuating Soviet citizens even if they had married Polish soldiers while in the Soviet Union. Naturally, the very fact that Anders agreed to sign such a document raises questions. In practice, however, Anders went even further than the wording of the document required. At a meeting with several rabbis and Jewish communal workers, and in a note he sent to London, Anders claimed that the Soviet Government "agreed to the evacuation of the close relatives only of those Jews who were serving in the units now stationed in the Soviet Union." In other words: Anders blocked the evacuation of the relatives of those soldiers who had left during the first stage, claiming this was in accordance with Soviet desire. Anders similarly ignored the fact that Jews who were residents of the western provinces and who had not had Soviet citizenship thrust upon them were eligible, from the Soviet point of view, to leave just like any other Polish citizen. In his meetings with Jews and in the reports he sent to London, Anders continued to claim that any attempt to circumvent the Soviet directives would jeopardize the whole evacuation project. On the other hand, he did declare that he had no reason to oppose attempts on the part of Jews to obtain exit permits from the Soviets and that these permits would be honored by the Poles. A group of Bund activists who had obtained Kot's recommendation for evacuation, met with Anders and asked to be declared Poles for purposes of the evacuation. Anders "categorically rejected" their request. The Bund members related that all those who had stated that they were of Jewish faith were dropped from the transport roster of August 9, 1942. On the other hand, those Jews who declared themselves to be Roman Catholics did leave.122 By way of an aside, it is of interest to point out that the Jewish Agency intervened with the Polish authorities to allow these "Marranos" to resume their Jewish identity even while they were in Iran. "General, why do you tell the Jews that we are making it difficult for them to leave? Do you not know that we in fact do not check the lists, that we close one eye to what is going on, and that from our point of view it makes no difference who goes, Ivan, Peter or Rabinovitch?" At the meeting Zhukov also produced the protocol mentioned above and demonstrated that the Polish interpretation of Jewish family relationships did not coincide with the stipulations of the signed document. "The atmosphere at the time the evacuation lists were drawn up was such that even after it was explained to the Jews who bore responsibility for the harsh directives and why they were issued, they still did not believe the explanation. The mood prevailing not only among the men but also among the officers of certain, types was near rejoicing over the prohibition to include members of the national minorities." Hoffman also reports that he was told about one commanding officer who took pride in the fact that he did not include even one Jew in the list of evacuees he had prepared. The liaison officer who was in charge of the evacuation of the Fifth Division, Witold Misztowt-Czyz, submitted a detailed and angry report of his battle to manage the evacuation of a group of Jews. According to the report, he put together a list of relatives of soldiers who were eligible for evacuation, according to the directives, but Lt. Col. Dudziriski, who was in charge of the evacuation of the unit, removed from the list of Polish citizens, members of the following minority groups: 1) who were by nationality Tatars and Moslems by religion; 2) Jewish apostates who represented themselves as Catholics and as Poles; 3) assimilated Jews who were listed in the census as Poles; 4) a small group of Jews who declared themselves to be Jewish by nationality. The author of the report claimed that the majority belonged to the working intelligentsia and included army veterans, orphans of military personnel, handicapped soldiers and Polish industrialists; "many of them could claim rights earned by their efforts for the Polish cause." Misztowt-Czyz requested the intervention of the army staff. The problem of the Tatars was immediately settled: they were reinstated on the list. What remained to be solved was the problem of the apostates and the Jews, who numbered 52 families (122 souls in all). General Bohusz-Szyszko favored including them all in the list of evacuees. Bishop Josef Gawlina, the highest ranking religious authority in the armed forces, issued a declaration on behalf of the apostates in which he noted that racial conceptions were foreign to the Roman Catholic Church. Nevertheless, Lt. Col. Dudzinski stood his ground and refused to put the names back on the list. Misztowt-Czyz also charges that this same Dudzinski removed fifty Jews from the evacuation train even though they had every right to be in the convoy. Misztowt-Czyz concludes that an injustice had been done to Polish citizens who were fully entitled to leave for Iran." "Circles in international Jewry will, of course, act upon the advice of our Jews who are embittered because so few were allowed to leave, and will put all the blame upon the Poles. As far as Polish state interests are concerned it is immaterial whether the blame is laid upon the civilian or the military — the Embassy, general headquarters or division staff. It is quite likely that the Soviet authorities will endeavour to portray the matter in a fashion unfavorable to Polish interests, and that they will do so in the context of the clash over the eastern territories. Soviet propaganda will claim that the Polish authorities did not want to take the Jews, and they will supply the Jews with the appropriate propaganda materials. It won't be difficult for them to obtain such. I shall cite as an example the cable which the [Soviet] Commissar for Evacuation Matters attached to the Fifth Division, sent to Bishop Gawlina in Yangi-Yul, stating that the Armed Forces 'were employing racial tactics.' For this reason I advise that the only [correct] approach would be the adoption of a unified front by all elements directly involved in the evacuation and the briefing of all those who must know about the evacuation with one version only, namely that restrictions were applied to the departure of Jews only because of the absolute prohibition imposed by the Soviet Government. If need be, we will be able to produce appropriate material to confirm this claim. All reports giving unfavorable details of the evacuation campaign should be treated as top secret, lest they fall into the wrong hands. The antiSemitic behavior of certain officers — which has been blown up to maximal proportions — should be explained as acts of isolated individuals for whom those in charge of the evacuation cannot be held responsible." It is abundantly clear that the composition of the evacuation lists, the treatment of Jews during the evacuation and the small numbers of Jewish soldiers and civilians among the evacuees all helped to reveal to the free world the anti-Jewish discrimination and the extreme anti-Semitism practiced by many Poles. According to a Jewish estimate, 3,500 Jewish soldiers were evacuated; according to Anders, 4,000. Even if we accept the Polish figure as the correct one, we are led to an instructive conclusion. Until the end of 1941, the Soviets placed no obstacles before the recruiting of Jews; in fact, according to Polish sources just the opposite occurred — the Soviets deliberately channelled large numbers of Jews to the recruiting centers, and as a result they made up forty per cent of the initial recruits, and some say even more than that. If we may assume that the Polish Armed Forces numbered some 40,000 men till the end of 1941, then the number of Jews was at least 10,000. When the Russians began to place restrictions on recruiting from among the minorities, they also tried, according to Anders, to have the restrictions applied to parts of the force already in existence. Anders claims that he bitterly opposed the Russians on this point, arguing that a law cannot take effect retroactively, and the Russians were forced to accept his position. If all this is true, the question then arises: where did all the Jews, who by all accounts were allowed to remain in the army, disappear? There can be no doubt of the answer: in addition to the restrictions of the Soviets and the disqualifications by the Poles of new recruits, a drastic purge of existing units must have taken place. There is no reason to attribute to isolated officers the policy of discrimination in the drawing up of the evacuation lists. The Embassy sought to mitigate the extremism of the Armed Forces and to include a larger number of Jews in the lists, in particular the more recognized Jewish leaders. As we have seen, the Embassy's efforts had disappointing results with the open rivalry between the Armed Forces and the political elements serving as at least a partial cause. Some officers chose to behave in a brutally anti-Semitic manner, making the situation in fact harsher even than the stated policy, and only a few spoke out openly against the discrimination and sought to intervene to whatever extent they could. It is very possible that the N.K.V.D., wanting to embroil the Poles, sought to utilize for their own propaganda purposes the unrestrained anti-Semitism which was rampant among them. However, we may also assume that even had those circumstances had no connection with the Soviet restrictive regulations, the Russians would hardly have allowed the Poles to carry out their machinations while attributing them to the Soviet authorities. Naturally, as in the earlier stages, those who suffered and were injured in all cases were the Jews. Brief mention should be made at this point of the "desertion" of Jews from General Anders' Armed Forces, even though this is not the concern of this article and the topic merits a separate and independent study. While the force was stationed in Eretz Israel desertion from the ranks reached massive proper-tions. According to Anders, 3,000 out of 4,000 men deserted. We may assume that a prime motivation was the strong desire to become a part of the new Jewish community in Eretz Israel after the bitter experiences in the Soviet Union and in full awareness of events in occupied Poland. Furthermore, the anti-Semitism and discrimination in Anders' army during recruitment and later during service also had their bearing on the decision to desert. We cannot determine the individual weight of each factor in the final decision nor can we know what ultimately tipped the balance, but it is reasonable to assume that both factors played a role and prompted many to decide on desertion. In his memoirs, and in declarations made elsewhere, Anders claimed to understand the motivations of those Jews who wanted to remain in Eretz Israel. For that reason he did not want to employ force in recovering deserters and did not even mount searches for them. This contention put forward by Anders years after the fact, while basically true, is not the whole truth. Anders claimed at meetings with Jewish representatives in Eretz Israel that the desertion of Jews was not significantly damaging to the Force since he was bound to lose at least an equal number in battle. However, he did feel that this type of flight would most likely influence future relations between Poles and Jews. Anders sought to stem the wave of desertions by using various means of persuasion; certain Jewish elements also opposed the mass desertion of Jewish soldiers, out of a concern for the future welfare of the Jews of Poland after the war. It is worth pointing out that Anders emphasized that the thousand Jewish soldiers who remained in the Force fought bravely and no less gallantly than all the other soldiers who travelled the lengthy route from the Soviet Union through the Middle East to the bitter struggle over Monte thus continued their struggle. Source: Yisrael Gutman, "Jews in General Anders’ Army In the Soviet Union", Yad Vashem Studies, Vol. XII, Yad Vashem, Jerusalem, 1977 pp. 231-296. *. Members of the Narodowa Demokracja — ND — The right-wing NationalDemocratic Party, of an extreme anti-Semitic character. **. Sanacja (regenerative purge) — the name given to the regime that took power under the leadership of Pilsudski after the coup d'etat of May 1926. It remained in power until the outbreak of WWII.